Replacement Convertible Tops - What Are Their Benefits? Replacement Convertible Tops | What Are Their Benefits? If your convertible top has been damaged then you don’t need us to tell you the benefits of a replacement convertible top. You need a top to restore its value and to keep the rain and cold out. But even necessities can bring benefits to you. Let me explain. Many of us don’t take action until action is forced on us. Let’s imagine the damage occurred three or four years after you bought your convertible. By then your top may have been stained, it may have faded somewhat or it may not fit as snugly as it did coming out of the showroom. All of these age-related events gradually reduced the value of your car. Because they were gradual changes you may not have even noticed them. But to an outsider, or even a potential buyer, they all registered and reduced the resale price. An accident or an act of vandalism would change from gradual decline to a situation which needed immediate action. An aftermarket provider of replacement convertible tops could offer you an immediate solution. You would get a great price and also access to an unbelievable range of choices for your new top. These options put you in the driver’s seat, so to speak. They make you the master of your car’s redesign and restyling. The side benefit of this is that your car not only regains its former value but probably increases in value because it is now truly unique. Convertible tops can last for many years with proper care. However, frequent opening and closing of the top can speed up wear and tear. These actions are largely beyond our control, unless you can control the weather. For example, if you live in sunny Southern California it is likely your convertible top will remain safely stowed away from the first warm day in Spring until late Fall. In other less fortunate areas, variable weather may dictate frequent closings to avoid turning your car into a swimming pool. The downside is that frequent opening and closing of your top can cause wear and tear on the fabric top and also cause the cabling to loosen. Loose cables can be tightened to restore your roof’s leak proof ability. However, over time, cables stretch and the ability to tighten them sufficiently is lost. When you install a new roof we always recommend that you change your cables. The new cables will make your roof snug again. The noise level will drop noticeably. Dust and moisture entry will be virtually eliminated. These comfort features are extremely important. But, in addition, you get all the benefits of designing your own unique color and fabric top. Your replacement convertible top gives you greater comfort and lets you make a statement about you and your car. We have lots of useful information on our site to help you make an informed choice. Click here to see a range of fabrics, patterns and colors that you can use to design your one-of-a-kind convertible top. Call us at 1-800-543-9373. 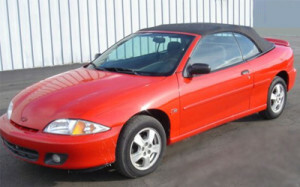 Replacement Convertible TopsWhat Are Their Benefits?